Serafina, the Guardian of Biltmore Estate, has won battle after battle against the dark forces encroaching on her home. A mysterious threat moves toward Biltmore, a force without a name, bringing with it violent storms and flooding. The Serafina Series and Willa of the Wood are published by Disney Hyperion, a division of Disney Books and Disney Publishing Worldwide. The team at Disney Hyperion in New York has published many best-selling books for children, young adults, and adults, including Rick Riordan's Percy Jackson & the Olympians series and others. Disney Books also publishes Star Wars, Frozen, Maleficent, and other well-known franchises. The Serafina Series is published by Egmont Publishing in the UK, Australian, New Zealand, and other Commonwealth countries. 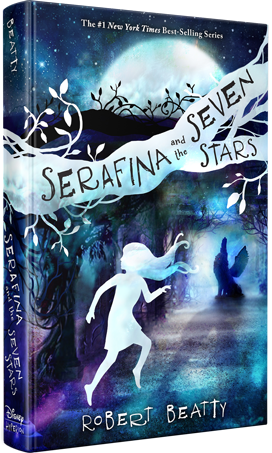 The Serafina Series has been translated into more than 22 languages and published by prestigious publishers around the world, including in Spanish, Italian, German, French, Romanian, Russian, Slovak, Czech, Greek, Mandarin Chinese, Polish, Hungarian, Dutch, Portuguese, and Turkish. Willa of the Wood is also also in the process of being translated into many different languages and published around the world, with Greece and Germany leading the way. If you are a foreign publisher interested in translating/publishing any of Robert Beatty's books, please contact his literary agent Bill Contardi (212-661-6474 or EMAIL) of the Brandt & Hochman Literary Agency in New York City. The Serafina Series is also published by Scholastic Books and sold at Scholastic Book Fairs.